One of the odder legacies of imperialism and colonialism is the enduring fascination with which many of us look upon agents of colonial power who went semi-native: adopting many of the customs and attitudes of the people whose lands they colonized, yet clinging all the while to customs and attitudes of the countries they left behind. The lives of these people have been explored by many notable writers -- E.M. Forster, Evelyn Waugh, Graham Greene, Isak Dinesen, Paul Scott, Paul Theroux, William Boyd -- and during the 1980s the subject made a big splash in upmarket television with "The Jewel in the Crown," the BBC adaptation of Scott's Raj Quartet. 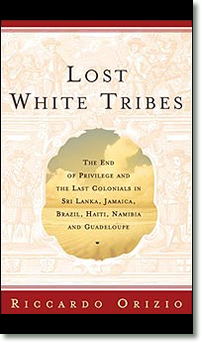 The subtitle of Riccardo Orizio's book -- "The End of Privilege and the Last Colonials..." -- suggests a venture into the same territory, and it was with precisely this expectation that I picked it up. 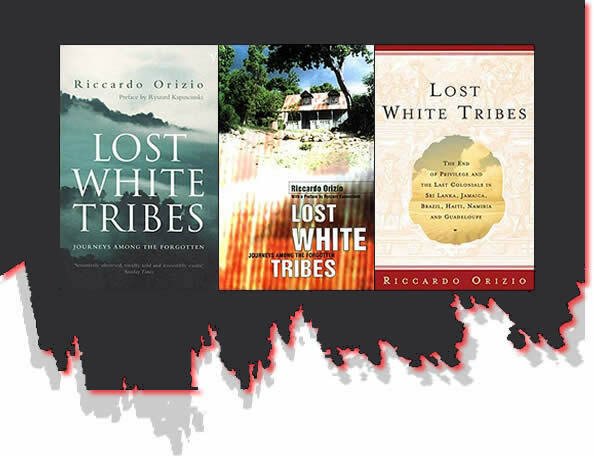 But the subtitle is seriously misleading, for few members of the "lost white tribes" about whom Orizio writes are "privileged," and not many of them (or their forebears) were even "colonials" as the word is commonly understood. The Dutch Burghers of Sri Lanka (Ceylon, as it was called in imperial days) fit that description in some respects, but the others in this tale are mostly people whose communal histories are more complex and ambiguous than those of, say, the cricket-playing British clubmen and their wives who brought the Raj to India. "That was how I found my first White Tribe: by the side of a tropical road, more exotic than all the exotica around me. Like other tribes I would meet in the next few years, walking a thin line between privilege and discrimination. Poor. 'Lost' because reduced to being a historical fossil, little more than a generic anomaly for whom no one wants to claim paternity. Too white for some. Too native for others. Their society a closed, incestuous microcosm." These little enclaves of voluntary or involuntary outcasts can be found in many places -- Orizio mentions, among others, South Africa, Malaysia, Belize, Afghanistan, Eritrea, Somalia and Ethiopia -- but the focus here is on the six countries mentioned in the subtitle. "Focus" is not exactly the word, for Lost White Tribes is a strangely unfocused and elliptical book. It is indicative of Orizio's haphazard approach to structure that although the first chapter is about the Dutch Burghers of Sri Lanka, it is not until the last chapter -- about the Blancs Matignon of Guadeloupe -- that we are given a satisfactory explanation of who, exactly, they are: "The Dutch had a name for these people in search of adventure and land. They called them Burghers... The Burghers, whether in Kaapstadt (Capetown) at the southern tip of Africa, or in Borneo or Ceylon, were first and foremost rebels and misfits and possibly, at heart, entrepreneurs." The descendants of today's Dutch Burghers went to Ceylon during the 17th and 18th centuries, in "what would come to be called the Hollandse Tijul, the period of Dutch rule" there. They were, as indicated, entrepreneurial types, but over the years the country changed and the blood began to thin. One old woman told Orizio: "We Burghers have become strangers in our own land. We have given so much, created so much. And now that I'm old, it sometimes happens at a reception that someone will ask me where I come from and how long have I lived in their beautiful country. They take me for a tourist, or a missionary. I tell them that my ancestors have probably been here longer than theirs. But the old times are gone forever. My parents and their friends would go horse-racing, then on to dinner, then dance until dawn. Then they would jump in their cars and dash down to the beach for a swim..."
That turns out to be one of the precious few passages in this book that suggests an end-of-the-empire nostalgia. For the most part the people whom Orizio found in other countries have little to look back upon with fondness and much in the present to regret. The Germans of Jamaica are the descendants of people who "found themselves in Jamaica in the winter of 1834 working as slaves in one of the harshest, most intractable woodland regions," apparently having been tricked into believing that they were coming to America as free men and ending up in Jamaica as indentured workers. The Poles of Haiti originally were hired to put down the island's famous slave rebellion in the early 19th century; in the subsequent massacre of whites, they were spared by Jean-Jacques Dessalines, the rebel leader, because the Poles "were brave people whom despotism had armed against liberty, but ... in their own country they had fought long and hard against tyranny," according to Thomas Madiou's history of Haiti. No doubt it reflects an American bias, but to my mind the most interesting "white tribe" that Orizio describes is the outpost of descendants of Confederate diehards who fled to Brazil at the end of the Civil War. They left the South "between 1865 and 1885" in "self-inflicted exile, rediscovering their pioneering instincts and setting out in search of a rural Eden even further south than the South they knew, rather than become subject to those 'damned Yankees.' " Their descendants think of themselves as true to their forebears ("We've got nothing against anyone, not even the blacks," one told Orizio. "We're honest citizens. But we've got this history behind us and, in our hearts, we'll always be rebels"), yet they are also culturally divided. As one put it, "I don't really feel American and I don't feel as Brazilian as I should." That sentiment is echoed, with variations, by many of those whose voices are heard herein. The strangest by far are the Blancs Matignon of Guadeloupe. "Two centuries ago," Orizio writes, "when Napoleon was ruling Europe, a small group of French colonists decided to abandon the ports and farms of this wealthy colony and hide away in the furthest corner of the island, a prey to hunger and disease." Why they did so is a mystery, though Orizio suggests two alternatives: that they were "aristocrats fleeing the guillotine, or smalltime slave-owning farmers clinging to a traditional way of life." Whatever the explanation, their descendants are wholly isolated, afflicted with racism, and so thoroughly inbred that "everyone ... is a cousin if not a brother." In search of "some fresh blood to inject into the veins of our children," they have begun to intermarry with nonwhites, but the lasting damage probably already has been done. There are, perhaps, morals to be drawn from these stories -- "All of us, beneath our apparent normality, belong to a lost tribe," Orizio somewhat portentously suggests. "We can all become minorities. We are all potentially irrelevant" -- but the temptation probably should be resisted. Best to read Lost White Tribes as a collection of snapshots, and to wish that the lens had been in sharper focus.